changed - and is still changing - in the tropics. a much warmer world within the last 50 years. the National Academy of Science. and with 6.5 billion people inhabiting the planet, that's serious." not be contaminated by such far-out, fringe nonsense..
my research seems to suggest. our planet system if unless their numbers are scarily high). funding in these distinct areas of research. "The Man Behind the Curtain". structures to hide out in when the sky comes crashing down around them. were in Nazi Germany, only globally, was just "out there." get from here to there, and then the next day, we will be THERE. Siberia that was found with undigested buttercups in its stomach. It was flash frozen almost instantly. that the "experts" are that stupid. also, we just don't know when. course, I am just remembering this from what I heard on a radio show. There is, naturally, a lot more to it than that. And he keeps repeating, "It's a cycle, it's a cycle, it's a cycle." So maybe he is on to the same thing that the C's were talking about? think I have heard other comments here and there about it, too. that he had the courage to say what they were afraid to admit. the equals of scientists who fly into hurricanes. world understands how the atmosphere functions better than me." be heard? Why has he spent 100 K of his own money on his research? been more strong hurricanes and cyclones in recent decades. could rise just a few inches, or nearly three feet. happening because of human beings, isn't going to be a big problem. about it other than adapt. to the truth. But notice how cleverly he has concealed the problem? turning vague scientific statements into headline-grabbing alarmism. the real science! Interesting how he mixes it all together. Many skeptics work in think tanks, such as the George C. Marshall Institute or the National Center for Policy Analysis. They have the ear of leaders in the White House and on Capitol Hill. dropping - concern information that is going to get very tricky! Administration sychophantic rags on the market! What is up with that?! comment about this article accusing the Post writer of being a LEFTY!!! reports the skeptics arguments, now veers off to the left, accusing Dr.
Richard Lindzen as being just simply part of the minority "Old Guard." Minister disavowing the "fact" of global warming. severely ponerized and even have become "doublespeak." Ninos through 2018 (Landscheidt, 2000). basis of solar motion cycles two decades ago. As to temperature, only El Nino periods should interrupt the downward trend, but even El Ninos should become less frequent and strong. and a strong rise in temperature. Astrology," based his forecast on the Gleissberg cycle of solar activity. headed into an ice age by the year 2012" seem a lot more plausible. it was predicted on the basis of solar motion cycles two decades ago. sunspot cycle was considerably stronger and more active than predicted. Again, a forum member dug up some data. You can read it HERE. Global Warming Scenario. Where did these things come from? Sez who? Royal Society A 364: 1627-1635.
sheet," which together comprise "72% of the grounded ice sheet."" warming of the world in the past two millennia or more. KNOW IT IS! So, how can this be? important factors are minimized, if not actually buried..
disintegrated, it cooled closer to the pole. light spectrum we can sense as heat but that human eyes cannot see. that period, and blue shows where temperatures predominantly decreased. region around the pole. Another possible explanation involves ozone. cooling trend in the interior of Antarctica. the ice sheet and slowing the rise in sea level caused by melting ice. cause devastation on islands and coastal lands. Antarctic ice sheet gained 45 billion tons of ice. evaporation from the oceans puts more moisture into the air. for a long time, it's just that no one has measured them before." kilometres, roughly the same size as the United States. rather than losing it," says Davis. reported rise of the sea levels by 1.8 millimetres per year. I think we just caught them in a lie. But we'll come to that. as a long-term protection against a rise in sea level, warns Vaughan. the summer, leading to direct melting of the ice there. swelling the world's oceans further. coast, so a vital piece of the puzzle is still missing, says Vaughan. snowfall comprehensively on the ground, he adds. coast, providing evidence of exactly how much ice is being lost there. Only when scientists put all these measurements together will the full truth about Antarctica's ice become clear, says Vaughan. truth about Antarctica's ice became important - and even scary! years despite wide predictions of a thaw, scientists said today. disappeared. I mean, there's not even a google cache of it. Nothing. function. Alternatively, return to the front page. keeps the North Atlantic region warm. "The overall ice thickness changes are ... approximately plus 5 centimetres a year or 54 centimetres over 11 years." gases from burning fossil fuels in power plants, factories and cars. offset by a melting of glaciers around the fringes of Greenland. Satellite data is not good enough to measure the melt nearer sea level. Oceans would rise by about 70 metres if the far bigger icecap on Antarctica melted along with Greenland. Antarctica's vast size acts as a deep freeze likely to slow any melt of the southern continent. The panel that advises the United Nations has predicted that global sea levels might rise by almost a metre by 2100 because of a warming climate. levels are probably rising slightly because of a melt of ice sheets. Alley of Pennsylvania State University in the US says. bad, but in the Arctic, it is a building cataclysm. advance; that many fewer mouths to feed, doncha know? be here sooner than anyone expects. valleys, grind rocks to nothing and reduce the height of mountains. water, the warmer the climate. evidence in the ice cores as the world warmed and cooled. Instead, they found that temperatures can drop suddenly and catastrophically. And it has happened many times. The change can come as fast as turning off a light. that had been recorded in Britain, Broecker focused on the gulf stream. the Gulf Stream, it would be like the frozen North of Alaska. The question that Wally Broecker asked himself was: "What would happen if this conveyor stopped? other words, at various times in the past the conveyor switched off. region that benefits from the Gulf Stream - froze. how to prepare for hotter weather and all the attendant extremes. Global Warming will increase winter rains in Britain causing flooding. the increase is due to "Global Warming." that fresh water is flowing towards the sinking zone of the conveyor. to sink and the conveyor - the Gulf Stream - would stop. Just like that. as a hurricane, it can be a very great amount indeed! Arctic ice sheets are melting and there is more release of fresh water. It, it's the most fundamental change I've observed in my career. began in the 1970s. No one knows where the absolute shut-off point is. We only know we are getting closer day by day. well take that to the bank. I was making as I dug into the issues. center of Greenland and Antarctica were scrubbed from the U.S. web. Predictions vary from the catastrophic to the cataclysmic. Glaciers are melting, the ice caps disappearing into the oceans. Sea levels may rise by many metres as a consequence. will find their habitats gone, their traditional lives unliveable. But how realistic is this picture? Is the world's ice really disappearing, or is it unscientific hot air? A European satellite named CryoSat was designed to provide definitive answers to some of these questions. principal investigator at the British Antarctic Survey in Cambridge, UK. studied - are in retreat. The ice dumped into the ocean as the glaciers retreat should not make much difference to global sea levels - perhaps a few cm. 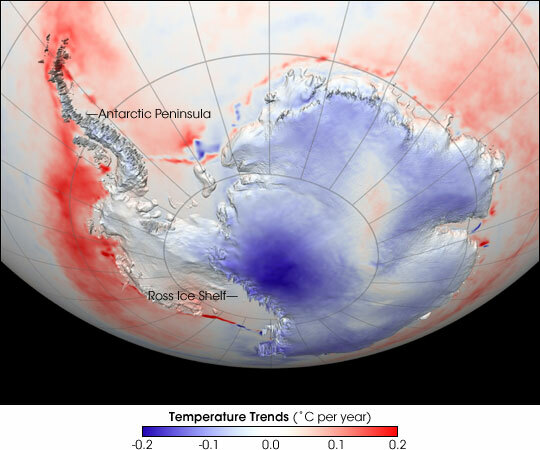 More worrying, potentially, are the vast ice sheets covering the rest of Antarctica. mission Grace indicates its mass remains stable. the ocean can't affect it." At the top of the world, the Arctic is a region built on water. Around the North Pole is ocean, with ice floes crowding in each winter and thinning again in the summers. Laboratoire Oceanographique in Villefranche-sur-mer, France. altogether during summers in the second half of this century." which spent long periods under the Arctic ice during the Cold War. But as a method of measurement, it is far from perfect; and satellites have given only limited help. variations between different parts of the Arctic. This is reflected in changes to ice cover on land as well as on sea. The Greenland ice sheet is, after Antarctica, the second biggest expanse of ice in the world. 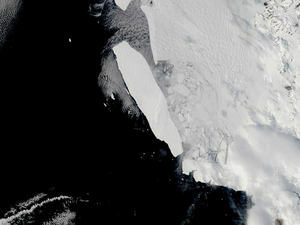 Its fringes expand and contract with the seasons; but images show it is melting more each summer now than a decade ago. from its ice sheet; by 2005, this had increased to about 220 cubic km. the U.S. controlled websites, this just sort of gives me the willies. What do they mean a "launcher fault destroyed the mission" ??? Russian space officials have identified the rocket fault that led to the loss of Europe's Cryosat satellite. A problem with the onboard flight-control system of the newly built upper stage of the rocket was to blame. The Russian state commission report clears the launcher for future use. measures is being implemented to prevent a recurrence of the incident. to reach orbit and causing it to nosedive into the sea. A board set up by the rocket operator, Eurockot, is to review the findings of the State Commission next week. and global climate. CryoSat-2 is due for launch in 2009.
have calved and part of the Larsen ice shelf has disintegrated. launch vehicle automatically interrupted its mission and began to fall. 3rd stage) and of the satellite impacted into the Arctic Ocean. A Word from the Chairman"
is there anything you wish to say before we launch into questions? period of time set aside, are these plans that are falling into place? I mean, what's the key in the lock? Q: (Terry)...transmit to us and back... what can be transmitted? Can the negative energy be focused through these microwave towers? (Terry) Well, HAARP has a lot more to do than just the weather. the surface of the planet" in either 3rd or 4th density. controlled or changed or in any way affected by HAARP? in preparation for the harvest. Is that world-wide, we're talking here? (Laura) No, we know what that is; they agreed to work with them. taken, what particular activities are being stepped up? simply out of the range of our limited imaginations! synthetic blood, and blood and plasma alteration lately? ahead, tell us about the synthetic blood and the blood plasma. one or two during the past 10 days. ice sheets, followed by increasingly rapid and intense glacial rebound. suggest you Google the term. in Arctic permafrost clathrates is estimated at 400 billion tons. clathrates has been estimated at 10,000 billion tons. the most rapid and extreme global warming events in geologic history. explanation that could be a result of underwater outgassing..
consider the consequences if the gas in question had been methane. the cold water at the lake's bottom is dissolved in great amounts. eruption occurs, large amounts of CO2 may suddenly come out of solution. respiratory problems, burns, and paralysis as a result of the gases. It is believed that up to a cubic kilometre of gas was released. of the waters of the lake. Trees near the lake were knocked down. term." is not entirely correct. John Barnes, in his fiction novel, "Mother of Storms," described the release of vast quantities of methane as the trigger for a global superstorm that nearly destroys the earth. up by 10 degrees F in a matter of months. roles would be reversed to what Barnes imagined: it would be the U.S.
enough methane would be released fast enough to make such an impact. gas and consist of a 'cage' of water molecules surrounding the gas. it, possibly more than the traditional fossil fuel deposits. doubled CO2 would be about ten times the present methane concentration. reduces Florida to a limerock reef in a matter of hours! severe than on the Southern hemisphere. finally quick-frozen for the next 12000 years. NOAA; his son Sam, a high school student; and his wife Lucy, a doctor. frozen environment with Arctic gear and his survival skills. the end the movie created quite the political stir. how wooly mammoths could be flash frozen in mid-meal. cyclonic storms preceding the sudden onset of an ice age. distance of approximately averaged distance of 510,000,000,000 miles. discovered regarding outer planets and their moons. it about one light year, or less or more? brown star, and this comet cluster. These are two different things? by the passing of this brown star? supposed to look at a spirograph. from one direction, but from many directions at once. Is this correct? be "felt" by you and others, if you pay attention. mean, we won't have time! different because this time it is accompanied by a plane convergence. this general subject matter through this session, for your sake. relationship between Italy and Greece and where we are on the planet? Some kind of psychic link? about it because that's 3rd density!' See what I am saying here? and ready to change, and work and put the puzzle and mosaic together. believe so. That is the idea. So, everything depends on this. weather... is this connected in some way to some other event? giving off a lot of energy. Any comment? subduction quake... 10.4 on the Richter scale is almost inconceivable. and the brown star? Is it related? these events on the planet? so, what types of events would we include to create the background data? to have stronger and more frequent hurricanes? A: Oh yes, and faster when in response to global"warming." - Hibben, Frank, The Lost Americans (New York: Thomas & Crowell Co. 1946). - Sanderson, Ivan T., "Riddle of the Frozen Giants", Saturday Evening Post, No. 39, January 16, 1960. - Simpson, George G., Horses, New York: Oxford University Press) 1961.